It’s September again. The launch event of Apple’s latest generation of the iPhone (may be called iPhone 8) is fast approaching. Before the arriving of the new iPhone, which smartphones deliver the best performance in August? Is your phone on the list? 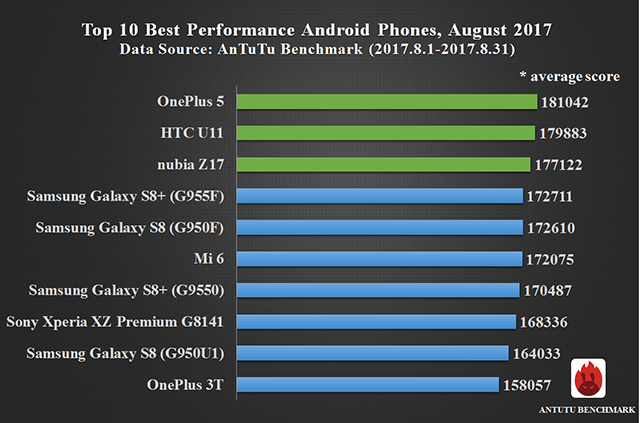 Today Antutu reveals our benchmark results for the 10 best performance smartphones of August. Come and check with us. 1. Statistics method: take the the average score of one device model, one chip model (the actual running results may fluctuate, which is a normal phenomenon). 2. Statistic time: August 1, 2017 to August 31, 2017. As usual，we have the overall smartphone performance ranking list as measured by average Antutu score which includes both Android smartphones and iOS smartphones as well as the separate ranking lists based on different operating systems. First let’s have a look at the overall performance ranking list. 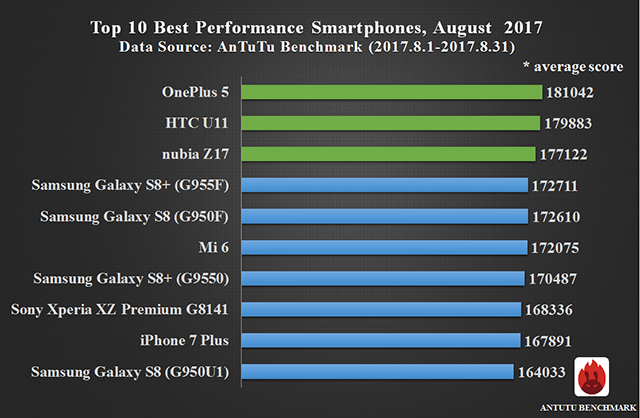 According to our most updated ranking in August, OnePlus 5 continued to top the overall performance ranking list with an average Antutu score of 181,042 points, followed by HTC U11. nubia Z17 made it onto the Top 10 list and ranked third with an average Antutu score of 177,122 points. Others on the top 10 list were Samsung Galaxy S8+ (G955F), Samsung Galaxy S8 (G950F), Mi 6, Samsung Galaxy S8+ (G9550), Sony Xperia XZ Premium G8141, iPhone 7 Plus, Samsung Galaxy S8（G950U1）, Samung Galaxy S8+ (G955F) and Samsung Galaxy S8 (G950F) . In particular, Samsung Galaxy S8+ (G955F) and Samsung Galaxy S8 (G950F) are powered by Samsung Exnynos 8895 processor while Samsung Galaxy S8+ (G9550) and Samsung Galaxy S8（G950U1）are powered by Snapdragon 835 mobile platform. All of the four models are high-end smartphones of the moment even though there are some differences in their Antutu scores. Turning to the Android list. excluding iPhone 7 Plus, OnePlus 3T broke into the Top 10 list with an average Antutu of 158,057. In particular, the refurbished Note 7-Samsung Galaxy Note FE made it onto Antutu Top 50 list, ranking 21th. Rankings of the iOS devices showed little fluctuations compared to our previous results in July. iPad Pro (10.5-inch) continued to top the list with an average Antutu score of over 220,000 with absolute advantage, followed by iPhone 7 Plus and iPad Pro (9.7-inch). The above data reflects the rankings of smartphone performance for July 2017. We also listed the top 50 performance smartphones in Antutu official website. For more information, please visit Antutu official website or download AnTuTu Benchmark and check in the menu of “Ranking”. In general, before Apple A11 processor appears on stage, Antutu performance ranking list tends to be stable. 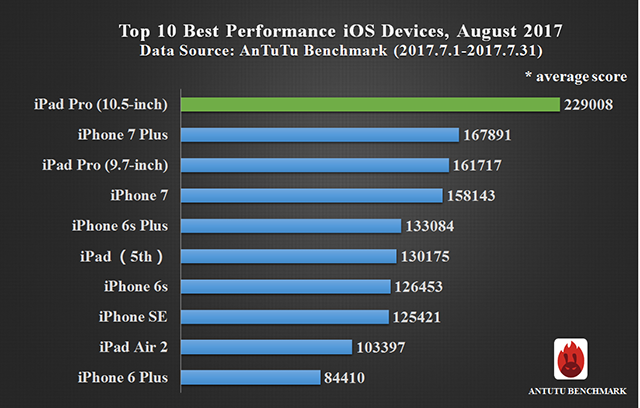 With new models like iPhone launching in September, there will be great changes in Antutu ranking list. Please stay tuned for our September ranking.